Over 20 beneficiary groups of President Museveni’s Shs5 billion donations in Rukungiri District have been found to be inexistent. 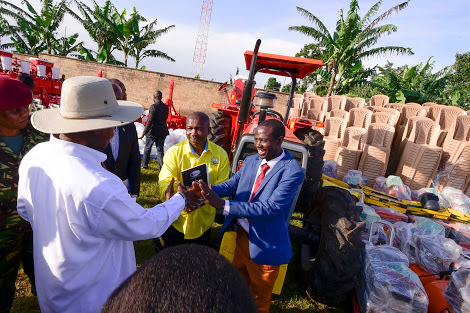 Mr Museveni on April 15 caused public uproar when he gave cash and items comprising motorcycles, trucks, an assortment of machinery and sofa sets, among others to residents of Rukungiri District, that is home to his political nemesis Kizza Besigye. And on Thursday, April 19, State Comptroller Lucy Nakyobe, during the verification of the actual beneficiaries of the President’s donations in Rukungiri, was shocked to discover that 20 of the groups and their members did not exist. Ms Nakyobe directed the RDC, Mr Martin Mugabe, to arrest such masqueraders that had formed the inexistent groups. “We shall not allow thieves of government money. All those involved will be arrested,” she charged. In response, RDC Mugabe revealed that he had forced another group of fruit vendors to return the Shs30m they had received, saying they were fighting to share it without using it for it’s intended purpose. At the function, Ms Nakyobe handed over some vehicles that had earlier been returned to Kampala for registration. The function was also attended by former Rujumbura MP Jim Muhwezi. The donations have attracted public backlash, with Dr Besigye accusing the President of using the donations to bribe the people ahead of next month’s woman MP by-election. MPs on the Presidential Affairs Committee led by Jessica Ababiku accused the President of using the wrong criteria to make the donations.